Exposing the crooks behind the myth! : YouTube user NoStarPanel Exposed! This is one of many conspiracy YouTuber's who help peddle the Nibiru hoax. NoStarPanel, who is in cahoots with none other than Marshall Masters of YOWUSA.com (say nomore!) 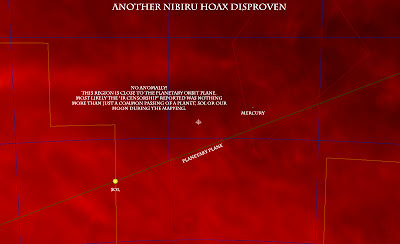 posts videos of blacked out areas of Google Sky, pretty much stating there is a global conspiracy to block Nibiru from view on these programs. Well, first of all his claims are absolute rubbish. First we had Nibiru only being viewable from the South Pole, which is why the South Pole Telescope was put there! Again complete tripe which was cooked up by Marshall Masters yet again. Nothing is "only visible" from the South Pole or that restrictive a position. The South Pole doesn't have it's "own little Hemisphere". If Nibiru was viewable from this location, then it would also be viewable to the entire Southern Hemisphere as well. Not to mention that Nibiru is meant to be a huge Brown Dwarf Star, with it's expected arrival sometime towards the end 2012, it would be one of, if not the brightest objects in the night sky. Not to mention that this type of body would already be wrecking havoc on the Solar System being less than 4 years away! Now back to the blacked out areas on Goggle Sky, which YouTuber NoStarPanel believes is hiding Nibiru. 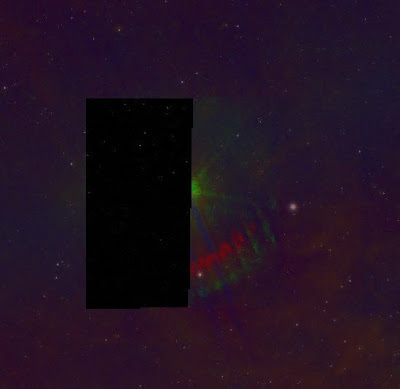 Well firstly this dimwit found a blacked out area in the Orion Constellation, see video here, one of the largest and perhaps the best-known and most conspicuous in the sky. Its brilliant stars are found on the celestial equator and are visible throughout the world. Its three prominent "belt" stars - three stars of medium brightness in the mid-section of this constellation - make this constellation easy to spot and globally recognized. From mid-northern latitudes, Orion is visible in the evening from October to early January and in the morning from late July to November. So this pretty much obliterates the "Nibiru can only be seen from the South Pole" argument once again. NoStarPanel has moved on from there, and has now found another blacked out area in Virgo, see video here. You can see an image of the blacked out area below. Wow, that's quite a leap there NoStarPanel! Virgo can be seen in spring and summer in the Northern Hemisphere and in autumn and winter in the southern hemisphere.Does this apply to Nibiru too!? Well sadly for NoStarPanel, this so called anomaly has already been debunked by another YouTube user. Video below. What passes through this region of the sky during October and why it was blacked out from the IR mapping? Answer, the Sun! Oh and just to add, this comment from NoStarPanel himself just shows he doesn't have a clue what he's looking at or talking about. That's one thing you got right NoStarPanel, you are not an astronomer, but many people are and they know what they're talking about. I guess they just can't be bothered to go out with a telescope and look for themselves and have to rely on freely, and quite frankly poor internet applications to look for something that isn't there. As conspiracies go, this one is exceedingly weak. We'll be running more articles on this NoStarPanel character, his connection with Marshall Masters of YOWUSA.com aswell as his connection between another YouTube user by the name of StevenWoodCERN. How this user also filters comments he doesn't like and how he and Marshall Masters file false copyright notices against people who go against their claims, resulting in them getting their YouTube accounts suspended. YOWUSA Planet X - Fact or Novel? What YOWCROOKS is all about.